The phrase ‘sweatshop labour’ conjurs up images of factory settings in far away lands with row upon row of machines operated by young women, all working long hours for poverty pay to earn profits in the millions for the western garment and shoe companies they stitch for. You might think of factory disasters, such as the 2013 Rana Plaza factory collapse in which over 1,130 workers were killed or the 2012 Ali Enterprises factory fire where 254 workers lost their lives. But you probably won’t think of a woman, we will call her Jyoti*, sitting bent double on the floor of her home, hand stitching leather uppers for shoes to be sold on UK high streets. Stitching just one pair of uppers could take her up to one hour. 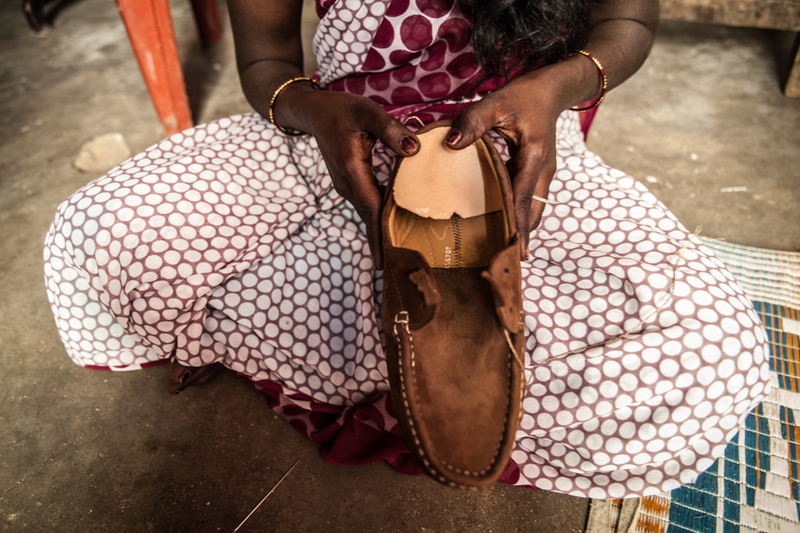 For this work she will earn, if for example she is one of the thousands of women homeworking in the leather shoe industry in India alone, the equivalent of less than 10 pence per pair of leather shoes. This is back-breaking labour-intensive work that requires the precision of hand stitching instead of a machine. 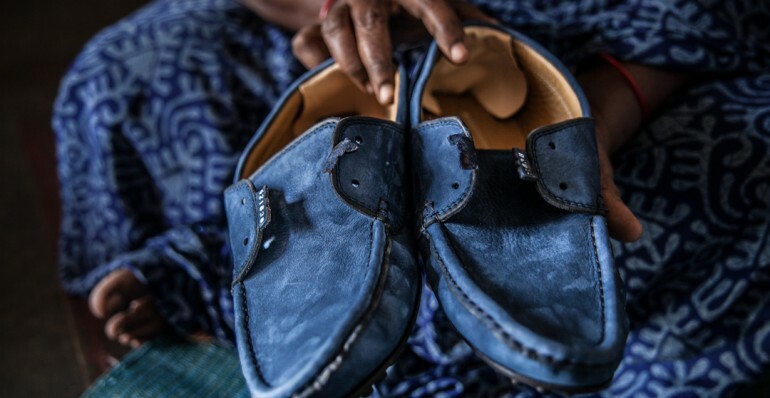 The work often leaves women with health issues and complaints such as hand numbness, eye strain, back problems, and skin rashes from chemicals used to dye the leather are all commonplace, and unlike their factory counterparts, homeworkers have no health insurance to allow them to seek medical attention. The maximum Jyoti can stitch in one day is 16 pairs, earning her under £1.60. Although cost of living differs, this is simply not enough to cover her basic needs. A kilo of rice alone costs her 43 pence. Jyoti earns well below a minimum wage, let alone a living wage, yet “whether we like it or not, we have to stitch. It is our only means of livelihood” she said. As a married woman with young children at home to care for, she combines her long hours stitching with unpaid domestic work, taking care of the home, children and her elderly parents. 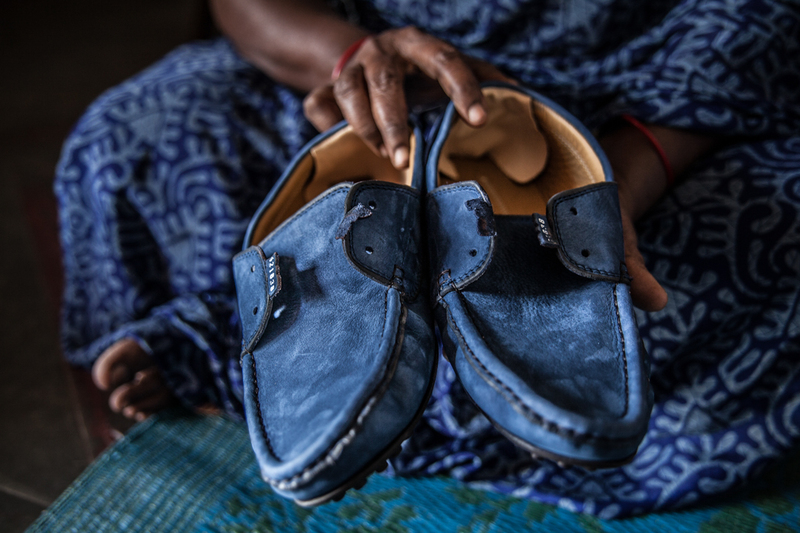 Given the entrenched gendered division of domestic work, for many homeworkers like Jyoti stitching leather uppers for shoes offers her the only opportunity for paid work that also allows her to maintain her family responsibilities, so cutting out homeworkers from the supply chain is not the answer. Homeworking in the shoe industry is not confined to India, instead there is a global workforce of women, often from the lowest social strata or caste, working from their homes across the world, from Bulgaria to India, Portugal to North Africa. Uniting these women are: poverty wages, well below those of their already low factory counterparts; extreme job insecurity, they have no contracts and are employed on a daily basis; lack of any recognition or benefits, such as health insurance or a pension, that are afforded to factory shoe workers. “We completed the work we got yesterday. We may or may not have work tomorrow. There is no job security.” said Sumitra, a homeworker from Tamil Nadu in India. They are a hidden workforce, providing both the low-cost labour and the flexibility so sought after in the footwear industry. This is the invisible underside of global shoe production. An ugly sole stitched from the exploitation of homeworkers, and one which remains unseen by consumers and often even by the brands themselves. 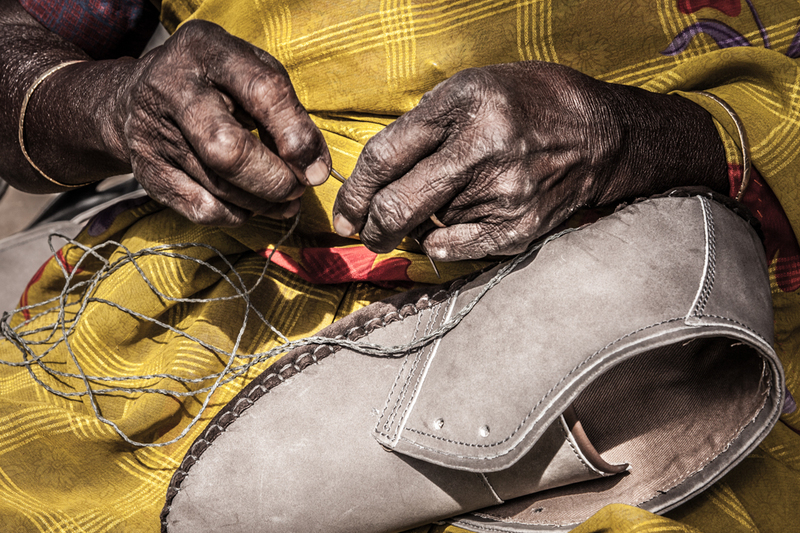 Today, on International Women’s Day, Labour Behind the Label with Homeworkers Worldwide are launching a new report, Stitching Our Shoes, looking at the key role homeworkers play in the production of leather shoes sold on UK high streets. As shoe consumption continues to rise, it is vital that we stop the exploitation and poverty trap that women homeworkers find themselves in. The answer is not the knee-jerk reaction that some brands may advocate of banning homeworking from their supply chains. This would result in homeworkers losing their jobs and the meager income they currently rely on, leaving them desperate and with no social security net to catch them. In fact, such a response may not even be possible, as homeworking is an established part of the supply chain and this may push the practice further into the shadows, thereby leaving homeworkers even more vulnerable to unscrupulous agents who take a cut of their pay: “We cannot negotiate with the middleman because the middleman knows many people who really need and want a job. So if I negotiate for one rupee or two rupees…They will give (the work) to some other area” Runa. There is a lack of transparency that runs through the shoes industry that enables exploitation on this scale. For change to truly happen brands need to publicly map their supply chains, to acknowledge homeworkers as key part of their production workforce, and to ensure that their rights are respected and that they are paid a living wage. They must do this through publicly sharing social audit reports and due diligence efforts. They must do this to ensure that women like Shanti face a better life:“We have nothing. That’s why we know this is employer exploitation. We have no other way. That’s why we are involved in this (work). If I had any other income, I definitely wouldn’t do this”. This blog was first published in Huffington Post and EcouTerre in March 2016.